During the period of the Pax Mongolica, approximately 1250-1350 C.E, links from the Mediterranean along the Silk Routes to China were forged again. The Mongol encouragement of trade and merchants was primary, but their tolerant attitude toward diverse religions was important as well. The influence of some of the royal Mongol women in forwarding these attitudes was significant. The power held by these high status women, compared to the rest of the thirteenth century world, was noted by western observers, including the North African Muslim traveler Ibn Battuta, who felt that the influence and status of the females at the Mongols courts was both dangerous and undesirable. Sorghaghtani Beki was one of these women who held great authority. Daughter-in-law of Chinggi (Genghis) Khan, widow of Toului, one of Chinggis' sons, and mother of Chinggis grown grandsons, she turned out to be a clever politician. 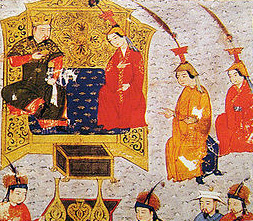 Thwarting the moves of Oghul to set her son, Shiramon, a nephew of Chinggi, as the next khan, Sorghaghtani pointed out that future khans ought to be Chinggis direct descendants. The powerful nobles quickly sided with Sorghaghtani, and Sorghaghtani's eldest son Mongke emerged as victor. In 1251, he was selected as Great Khan. Upon Mongkes death, only eight years later, another of Sorghaghtani's sons, Khubilai (Kubla) Khan, became Great Khan. It was he who conquered the China empire, establishing the Mongol Yuan dynasty (1272-1368). Another influential son, Hulagu, was sent west to capture Persia, Baghdad, and the Middle East. In 1253 Hulagu established the Mongol Ilkhanate, which governed Persia and parts of the Middle East. Although she was probably illiterate, Sorghaghtani saw the importance of literacy in the running of a far-flung empire. She prepared all her sons for khanship by educating them and making sure they learned the language of the region they ruled. She also encouraged them to learn as much as possible about their conquered societies. For example, understanding what Khubilai Khan would need in order to rule China, she introduced him to the concepts of Confucian thought. Generally the Mongols had a benevolent attitude toward foreign religions, or at least they followed a policy of benign neglect. They believed in Shamanism, but realized that an aggressive imposition of their native religion on their subjects would be counter-productive. Sorghaghtani herself was a Nestorian Christian. Her faith prompted Kubilai, on whom she had the greatest influence, to assist the small Nestorian community in China, whom the Western Christian hierarchy regarded as heretics because of their divergent views of the Trinity and Virgin Mary. When he gave his mother her own territory in North China, Kubilai let her follow her desires to be a supporter rather than exploiter of the non-Mongol peasants in the lands she controlled. Sorghaghtani is known to have demanded that the peoples of the Empire must be supported rather than mindlessly exploited. In all these matters her influence is said to have been decisive and to have strengthened Mongol rule considerably during her period. 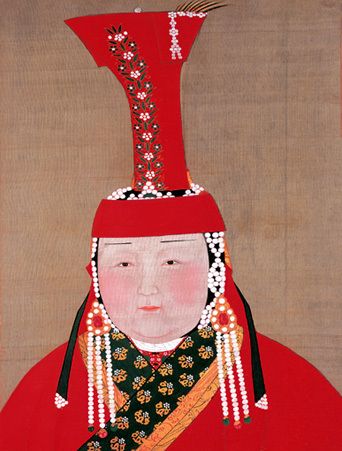 Other women of the royal Mongol rulers followed policies similar to Sorghaghtani. Another of her sons, Hulagu, married Doquez-khatum, a Nestorian princess like his mother. In 1258 when Hulagu infamously sacked Baghdad, toppling the Abbasid dynasty that had ruled the Middle East for five centuries, the lives of at least the Christians were saved through the direct intervention of Doquez-khatum. Hulagu's brother Mongke was impressed. "You would do well to consult her in all your affairs," he told Hulagu. Continuing to favor the Christians and be lenient toward all beliefs, one of Hulagus most impressive buildings was the great observatory on a hill north of Maragha, where Moslem, Christian, and Far Eastern scientists carried out their researches.